Baseball’s difficulties with gambling have a long if not distinguished history. From the early days of professional teams, the presence of gamblers at the various baseball grounds selling pools and taking bets caused second thought among fans and owners about the honesty of play on the field. The pronouncements of the founders of the National League in 1876 included platitudes about protecting the game and the fans from the evils of gambling. In 1877 the year-old league was faced with a major test of its willingness to back up those platitudes: a pennant-throwing scandal. Through early August, the Louisville Grays had built a four-game lead over St. Louis with a 27–13 record. On August 17, with about 20 games to go, Louisville started an East Coast road trip. The first eight games were against Hartford (playing home games in the more lucrative location of Brooklyn, New York) and Boston. The Louisville nine went 0–7–1 before losing two of three in Cincinnati on its way home. The Grays returned home in second place, seven games behind Boston. John A. Haldeman, a baseball writer for the Louisville Courier-Journal, saw something suspicious in the team’s play. Haldeman had very good access to team officials, because his father, Walter Haldeman, was the majority owner and president of the Grays. 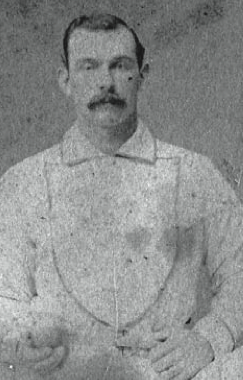 Through the younger Haldeman’s efforts, it came out that three Louisville players—pitcher Jim Devlin, outfielder George Hall, and substitute Al Nichols— were in league with gamblers to throw games. Also drawn into the scandal due to his earlier gambling run-ins with baseball officials was shortstop Bill Craver. All four were ultimately banned from Organized Baseball for life. Popular history holds that the four players arranged for Louisville to tank the season during the Eastern trip, giving the pennant to Boston. But evidence of this is hard to come by. The Louisville- Hartford game of August 20 at the Union Grounds in Brooklyn illustrates the difficulty. 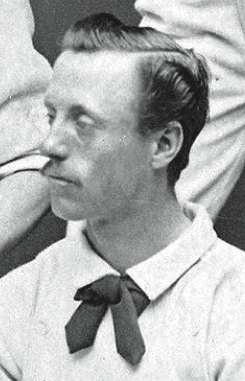 Devlin was in the box for Louisville, as he was for every inning during the 1877 season. With one out and a man on first in the top of the first inning, Craver muffed a soft toss from second baseman Joe Gerhardt. Instead of hitting into an inning-ending double play, Hartford scored an unearned run. Errors of all kinds were not uncommon, so pointing to Craver’s muff as evidence of a fix is problematic. With the score unchanged in the top of the fourth, Hartford’s Joe Start singled to right and took second on a passed ball. Bob Ferguson then sent a slow grounder to Craver, who tried to catch Start going to third. But his low throw was muffed by Bill Hague, who was charged with the error. Start scored Hartford’s second unearned run on a grounder to second. With two outs in the fifth, Hartford reached Devlin for a double and a run-scoring single to make the score 3–0. As Louisville came to bat in the sixth, the Grays had collected just one hit off Hartford pitcher Terry Larkin. Outfielder Bill Crowley singled with one out, went to second on a passed ball, and moved to third on Juice Latham’s single. On the play, Jim Holdsworth overthrew third and Crowley came home to make the score 3–1. Latham was advanced to third with two outs, but Hall sent a routine grounder to first to end the inning. Hartford bunched three hits each in the seventh and ninth to score two more runs, Louisville finishing with a total of four singles and a 5–1 loss. The play of Craver and Devlin may look suspicious, with Craver contributing to a pair of Hartford runs and Devlin not looking like the 27-game winner he was at that stage of the season. But that’s only because we know the end of the story. Did Devlin ease up in the game or even in all the games on the road trip? Earned runs in the 19th century are difficult to tease out of some box scores, but we do know that Devlin allowed an average of 5.05 runs (earned and unearned) per game before the start of the Eastern trip. During that trip he allowed an average of 4.75 runs per game. During the final 10 games of the season, he allowed an average of 3.77 runs per game. No obvious statistical evidence of any funny business there. But that is the problem with assessing an individual’s effort in any single game, or his contribution to a loss. Throughout the investigation of the pennant race, Devlin and Hall maintained that they never threw a league game. But Hall’s confession makes it appear that they did contribute to a 1–0 loss to Cincinnati on September 6. Otherwise, both players maintained that they only took money to lose exhibition games. Al Nichols didn’t say anything. He took his release and faded out of the major-league picture. Craver loudly insisted on his innocence, but having been involved in earlier game-throwing behavior, he was pretty much ignored by the National League leadership. There was another problem for a team trying to win (or lose) a pennant in 1877: Nobody knew where they stood in the standings. The Cincinnati club had started the season, disbanded, and reappeared later with new owners. The status of games played against Cincinnati was open to question. So newspapers ran several sets of standings. The Courier- Journal had a table in many editions including games against the original Cincinnati club; a table including all Cincinnati games regardless of ownership; and a table ignoring all Cincinnati games. In early September Louisville was either tied with Boston, half a game behind, or a game and a half ahead. In December the National League decided to toss out all Cincinnati games. Modern references include all the Cincinnati games, thus giving Boston a seven-game lead over second-place Louisville. But the lead shrinks to three games when following the league’s 1877 decision. That Devlin, Hall, and Nichols threw games in 1877 seems unquestioned. Craver’s role is more difficult to determine. But Boston’s 20–1 record from August 17 to the end of the season may have swayed the standings beyond what the Louisville Four did.